It's bizarre to know that there are only a few weeks left for the semester and there may be schools already out. At UH my last final is on December 7th and I don't go back until January 20th. So on my break, I usually bum out at home and go to work. This year I plan on taking full advantage of this time and have some well-deserved fun! So I've rounded up 10 either free or inexpensive activities to take part in. Also, keep in mind that every state/city is different regarding what kinda of activities are taking place, so have fun wherever you are! 1. Christmas movie marathon: Invite your friends over for a fun marathon including all of your favorite Christmas movies. Mine are ELF, Home Alone, and How the Grinch Stole Christmas! Have each guest bring their favorite movie and of course you have to have snacks! Load up on cozy, fleece blankets and hot cocoa! 2. Go Ice Skating: There's always been something so special about Ice Skating during Christmas time that makes it so appealing and beautiful. I'm not a skater, so ice skating is off the table for me, but I'd love to try it one day! 3. Go see Christmas Lights: I love driving around Houston looking for Christmas lights while listening to Christmas music. It's so fun looking at how people decorate their homes and it's one of those simple pleasures that I really love! The Houston Zoo offers a fun Zoo Lights and trail of lights which is also fun to see different designs and is low cost per person. 4. Write down 2018 goals: Every year I write down a few goals that I want to achieve during the new year, so winter break is a nice time to sit down and concentrate on the new year. Take this time to really think about what you want to do next year and write 'em down! 5. Bake Something: You know those Pillsbury cookies with the fun character designs on them? Well, I love them, so every time I see some I buy and bake them right away! During winter break bake something, bake anything! Whether you're baking homemade cookies or pre-packaged have fun with it, play some music and dance around in the kitchen! 6. Go to a Winter Market: In Houston, there's always a few markets going around and I'm sure you'll find some in your area as well. Most of these markets include small shops and local artists. I enjoy going to these markets and just looking at what people have to offer. This is also a good time to get some unique gifts. 7. Have a photoshoot: I love driving around the city looking for cute murals and places to take photos at, so why not get dressed up and invite the gal pals for a fun photoshoot. You don't need any fancy camera, just use your phone! 8. Much needed me time: This semester was much harder than last semester, some time is on the top of my list. Staying home in cozy pjs/sweats (whatever floats your boat) and catch up on your favorite shows and readings. 9.Try a new hobby: I don't have much hobbies and I'm constantly trying to find new and fun activities/ hobbies to try out. For the past year or so I've been really into watercoloring.Use your free time to try something new, learn how to watercolor, or get into knitting and crochet. 10.Volunteer: Use this time to give back to your community. During the holidays there are so many volunteer opportunities out there, whether it's at a food bank, animal shelter, or even helping out at your local church. There's always an organization that needs your time and effort. 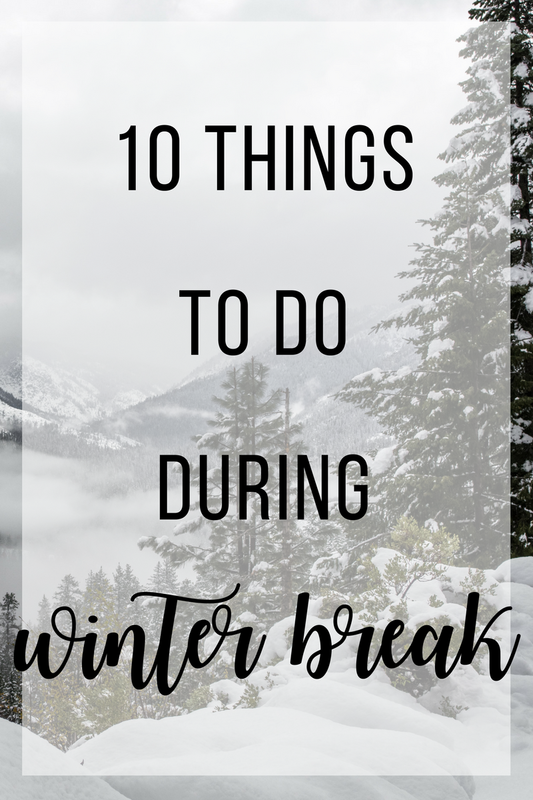 Do you have any plans for Winter Break? If so, let me know in the comments!